Japanese bakeries in Toronto are on the rise! It's great news if you're craving delicate crepe cakes, roll cakes, creme puffs, spongy cheesecakes, or sweet buns. Here are my picks for the top Japanese Bakeries in Toronto. Established in 1993 in Markham's J-Town, this bakery is a source for hard to find Japanese specialties like Mont Blanc (an almond sponge cake layered with chestnut purée), sweet buns (like melon pan or creme pan filled with custard), and soufflé-like cheesecakes. Following the success of the Kensington Market creperie, this Japanese dessert house has expanded its offerings to include a lovely assortment of thinly layered crepe cakes by the slice along with puddings, black sesame tarts, matcha azuki cake, cheesecakes, gelato-stuffed creme puffs, and more. Channeling the specialty cake shops of Japan like Cozy Corner and Beard Papa's (which once took a brief foray into Toronto), this cafe makes lovely roll cakes and creme puffs in-house. 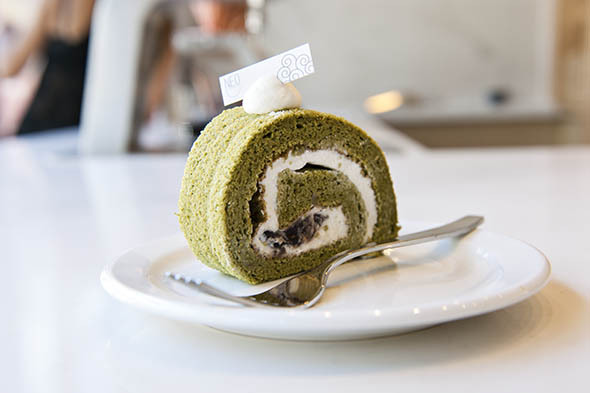 Not unlike Swiss rolls, expect swirls of delicately sweetened sponge cake paired with flavours like matcha, red bean, and even adaptations of Western favourites like strawberry shortcake. This Scarborough establishment is widely regarded as a top spot for sushi but the desserts are not to be missed. Save room for a slice of chocolate sake cake, light and airy matcha cake layered with azuki, green tea creme brûlée, and tofu cheesecake decorated with berries. This bakeshop specializing in Japanese style cheesecakes originated in Fukuoka and has since spread out across the globe landing in Toronto at the corner of Bay and Dundas. Characterized by its light, fluffy, soufflé-like texture, these cheesecakes attract long lines, and are sold alongside madeleines and rusks. There's also a Matcha Cafe next door. What did I miss? Add your favourite Japanese bakery to the comments. Photo from Neo by Morris Lum.